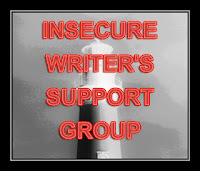 Today’s the day to post for the Insecure Writer’s Support Group started by the Ninja Captain. I don’t know where the time goes. Almost missed posting today. As Alex puts it, Time to release our fears to the world – or offer encouragement to those who are feeling neurotic. What am I insecure about today? It’s more observation-like than insecurity, but anyway...I’ve made a small switch recently and released an MG now. Apart from the promo periods—which I’m doing in fits and starts—the sales have been sluggish. I do plan to promote more in layers than fits and starts, but life, editing and writing tend to get in the way. In thinking about the situation, I have to remind myself to be patient and to keep plugging away. It’s easy to give up out of frustration, but who puts in hard work and comes to a dead stop without doing everything possible for a fighting chance at success? None of the courageous and sensible people I know. As they say, Rome wasn’t built in a day, so on I go. On another note, Alex spoke to an interesting topic in his post and I agree with him 100%. He’s testament to the fact that we shouldn’t give up on any manuscript. I wrote my first novel, the MG one, before I knew about the mechanics of putting a book together. It was a good story, but there were so many things wrong with it. I work-shopped it, people loved it and then I entered it in a contest. Looking back, I think the organizers were kind to give it a bronze medal, but boy have I learned stuff since then. I’ve taken the book to a much higher level with repeated edits and plot additions. My point here is that we all improve on our writing skill as time goes by. The better we become, the easier it is to see what’s wrong with a manuscript. I jokingly say that there should be a law against writing novels before we know what we’re doing. But you know what? That’s called apprenticeship and I can say with confidence that my most poignant works have come from that period. Of course, they take a lot of work to get to a publishable stage, but nothing worthwhile comes easy, right? So to wrap up, don’t be afraid to write what you wanna and move in a different direction, even if you’ve built a brand already. Secondly, don’t give up on what might look like a lump of coal at first glance. That’s a diamond in the rough that will shine brightly if you continue to chip away at it. Ready to try something new with something old? Do share. See list of other bloggers in this hop here. We often forget that at every step, we are learning and growing. And we can't stop in our efforts, because even if it doesn't look like something is happening now, we are building momentum for something to happen later. Wise words, Alex. I look at every stage as a lesson. I find it hard going to edit my earlier works, but it's worth it in the end. Exactly, Julie. We learn as we go along and we're building on our skills with each new thing written. Alex's post was awesome. I started looking through my drawer for old manuscripts. With everything you write, you're learning something new and getting better. Even if it seems like rubbish, it's helping you improve and grow into the writer you want to be. That's what I did in going from fiction to non-fiction. And I discovered that I'm a better non-fiction writer along the way. I understand sluggish. There are so many skills needed to make this stuff work...it can get overwhelming sometimes. Okay most times. great points! I totally agree. I've just finished rewriting the novel which I first wrote 2 years ago. And boy did I change a lot of things! When I started writing, I wrote non-fiction, which I enjoyed. The fiction stuff, which I also enjoy, followed later. Now I'm concentrating on the fiction and I've abandoned the non-fiction because I'd imagine that you can't write both equally well. Maybe I'm wrong. Joy, I enjoyed your MG story as well as some of your other stuff that I've already read. Everything we write is leading us forward to better things. I cringe when I read my early stuff but it is definitely how we learn our craft. I love these words of wisdom: "...don’t give up on what might look like a lump of coal at first glance. That’s a diamond in the rough that will shine brightly if you continue to chip away at it." I agree that if a writer feels passionately about a project, he/she shouldn't give up on it. Lovely post. You and Alex have given me a lot to think about today. It true that we shouldn't give up, but I'd really never thought about how many stories I have given up on. Guess I should go take a second look. Glad you're going back, yet moving on at the same time. I think you should definitely write in the direction your heart/mind take you. Passion is the fuel that keeps us firing on all cylinders. Diana, writing can be looked at as a voyage of discovery. You can say that again, Elizabeth. Sometimes, I do one thing at the risk of neglecting another. Nutschell, that's another thing, not being afraid to shake things up a little. Thanks, Michelle. I believe you can do both. When I came back to writing, I started with how-to articles about writing and now, I still write articles for the local lit page occasionally. I do however, understand wanting to learn the ins and outs of one particular area if you're proficient in another. That's for sure, Suzanne, and I'm grateful for the people who helped me learn to be a better writer. Doralynn, you're a good writer. Yup, you should have a look-see. Love that quote of yours, Mark. Without passion we wouldn't be as effective. I look on my first three unfinished novels as the best writing course I could ever do. And I think they are great stories. With what I've learned about writing since, I'm all for completing them. I am a little shattered by Christine's Odyssey. Very nasty beginning. Let's see where it goes from here. I only hope for a happy ending for the poor girl. Jemi, yeah, I do get a chuckle out of some of the messes I wrote in the beginning. Denise, someday, I hope to get all the editing I need to do done. I think the worse of the lot were the YA novels 'cause I cut my teeth on those. As to Christine, it does get worse before it gets better. I'd say enjoy, but it's a bit of a roller-coaster ride in terms of emotion. It definitely helps to write what's in our hearts. All manuscripts are worth something. A great lesson to remember. I agree completely! It is an apprenticeship. Nothing is learned except through practice and more practice. My first book still holds my heart too, warts and all. Thanks, Chairmaine, I keep trying. Sheena, that works for me 'cause I'm too lazy to throw any piece of writing away. Laura, though it's been painful to edit my first attempts at novel writing it's been good to see how far I've progressed and to remember that I don't have to be stuck in one genre. My very first novel will stay nicely in its drawer. But a more recent book, completed and shopped around a bit and rejected, before being set aside, has come back out and is being edited. And I'm remembering how much I like the characters and starting to plot a sequel. Absolutely. I took one of my drawer manuscripts and I'm rewriting it now. I love the process. I'm so much better compared to where I was years ago. So true. I have somethings in forgitten files. And don't have the nerve to pick it up now. Dare I? Or shall I? Rebecca, it's like coming back to long-lost friends. Hope the sequel progresses well too. Crystal, sounds like you're strong on stick-to-it-iveness. I think it's fun to give an old book new life. Medeia, I can so relate to that. You should, Nas. Go for it! Nancy, we demand so much of ourselves that sometimes we lose our grasp on reality and the true value of our work. Thanks. I so want to give up on editing my current manuscript and move onto the next but I'm afraid that will become a pattern. I am forcing myself to keep going just because I have to finish it. Good/bad/otherwise, it must be completed so I know I can do it. Thanks so much for stopping in and for sharing your method. I think boredom is why I move from ms to ms, but like you, I've learned to work on just a couple of things at a time. When the deadline is looming, I stick to the one that matters. New to your cite and it is beautiful! I am definitely going to be putting some of these books in my classroom library. I wrote my first short story in 8th grade, so when I go back to what I was writing in high school, I just shutter, and laugh.But the ideas are good, I just need to nurture the craft. Holly, practising our craft is important. Without knowing it, with each story, we get better at what we do.